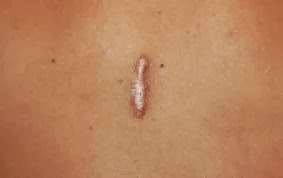 1 What is the difference between a keloid and a hypertrophic scar? 3 What are keloid symptoms and signs? 5 What are the treatments for keloids? Keloids can be considered to be “scars that don’t know when to stop.” A keloid, sometimes referred to as a keloid scar, is a tough heaped-up scar that rises quite abruptly above the rest of the skin. It usually has a smooth top and a pink or purple color. Keloids are irregularly shaped and tend to enlarge progressively. Unlike scars, keloids do not subside over time. What is the difference between a keloid and a hypertrophic scar? 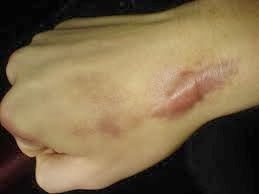 After the skin is injured, the healing process usually leaves a flat scar. Sometimes the scar is hypertrophic, or thickened, but confined to the margin of the wound. Hypertrophic scars tend to be redder and may subside by themselves (a process which can take one year or more). Treatment, such as injections of cortisone (steroids), can speed this process. Keloids are benign (noncancerous), fibrous skin tumours. They are most common in people with darker skin (e.g., people from West Africa or Southern India) and people usually develop them between the ages of 10 and 30. Both men and women are equally likely to have keloids. Keloids, by contrast, may start sometime after the injury and extend beyond the wound site. This tendency to migrate into surrounding areas that weren’t injured originally distinguishes keloids from hypertrophic scars. Keloids typically appear following surgery or injury, but they can also appear spontaneously or as a result of some slight inflammation, such as an acne pimple on the chest (even one that wasn’t scratched or otherwise irritated). Other minor injuries that can trigger keloids are burns and piercings. Keloids usually occur at the site of skin damage (e.g., acne, burns, chicken pox, cuts, insect bites, piercings, surgery, tattoos, vaccinations), although they can occur spontaneously. Whether or not a keloid will form is not determined by the severity of the wound – even a minor skin abrasion can result in keloid formation. Keloids are the result of abnormal wound healing. Normally, there is a balance between the production and the breakdown of collagen, which is a protein that makes up the fibres in the skin. With keloidal scars, the cells in the skin called fibroblasts produce excessive amounts of collagen. The collagen fibres are also thicker and wavier. This leads to the thick, raised appearance that is characteristic of keloidal scars. It is unclear what prompts this unusual healing process. Possible causes include genetic factors, skin tension, skin colour (they are more common in those with darker skin tones), and the presence of a very high number of fibroblasts in the skin. Keloid Removal can be done in various ways. Other use of steroid injections which are administered directly into the keloid to flatten it. They are often referred to as Intralesional Steroid Injections. What are the treatments for keloids? Cortisone injections (intralesional steroids): These are safe and not very painful. Injections are usually given once every four to eight weeks into the keloids) and usually help flatten keloids; however, steroid injections can also make the flattened keloid redder by stimulating the formation of more superficial blood vessels. (These can be treated using a laser; see below.) The keloid may look better after treatment than it looked to start with, but even the best results leave a mark that looks and feels quite different from the surrounding skin. Surgery: This is risky, because cutting a keloid can trigger the formation of a similar or even larger keloid. 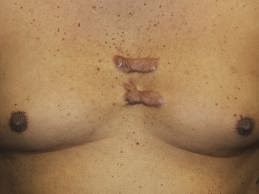 Some surgeons achieve success by injecting steroids or applying pressure dressings to the wound site for months after cutting away the keloid. Radiation after surgical excision has also been used. Silicone sheets: This involves wearing a sheet of silicone gel on the affected area continuously for months, which is hard to sustain. Results are variable. Some doctors claim similar success with compression dressings made from materials other than silicone. Fluorouracil: Injections of this chemotherapy agent, alone or together with steroids, have been used as well for treatment of keloids.